The GuideWire instantly flexes open to allow easy insertion and reorganization of cables, then snaps shut to keep them aligned - all without the need for tools or unplugging cables. Load cables in both sides of the GuideWire for maximum capacity. The GuideWire has 2 sided tape to mount it conveniently, and each one can Accommodate up to 5 cables. 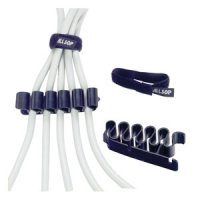 Two velcro loops are also included to help bundle and keep your cables neat and tidy. The Widescreen by Allsop is a large mouse pad designed with the same proportions as a widescreen monitor. No matter what size your monitor is, the widescreen allows you to navigate your screen without repositioning the mouse when you run out of mouse pad. 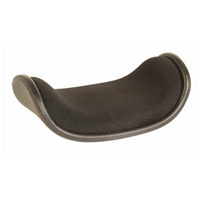 The surface is smooth and soft but textured enough to be used with an optical, laser, or roller ball mouse. 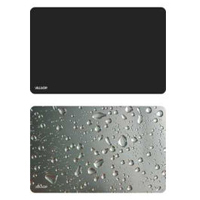 The Cupertino Mousepad from Allsop is a stylish mousepad made of clear, smooth plastic with rounded/tapered edges and a white underside, making it an ideal complement to similarly styled equipment, especially an iMac or iPod. 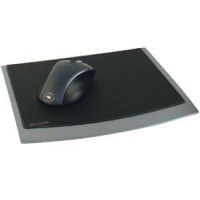 The mousing surface area is grey in color and slightly textured, allowing you to use it with both rollerball and optical mice. The underside also has Sure-Grip padding, so that the mousepad won't slide or shift while using it. 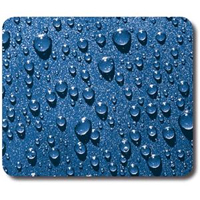 The Stellar EFX Mousepad from Allsop is a styled mousepad that uses a USB cable to light up 4 blue LED lights housed inside the mousepad to give it a unique look. The outer 0.75" edge is made of bubbly acrylic to give the mousepad a slightly retro look, especially when lit up. The mousing surface is black and textured, yet smooth enough to have your mouse glide on the surface. The mousepad itself is raised up on pads set at each rounded corner. It comes with an extra set of pads. The Allsop Redmond Mousepad is an oversized mouse pad that helps your mouse work better: it's textured to give better traction for roller-ball mice and it has fine tracking points for optical laser mice. It also has a rigid black mousing surface, a Sure-Grip base to prevent the pad from sliding, and comes in an attractive pewter metal frame. The Allsop Wrist Aid is an ergonomically design mousepad that angles your mousing surface (adjustable to 7 degrees) to prevent or reduce wrist-related injuries. It can be used by both left- and right-handed users and is made of stiff rubber with fabric covering and a non-slip underside. 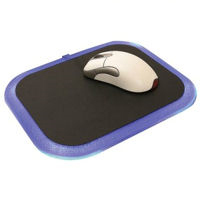 The mousing surface itself is made of softer rubber covered with blue cloth. Due to the nature of this product we cannot offer our 30 day customer satisfaction guarantee on this product. 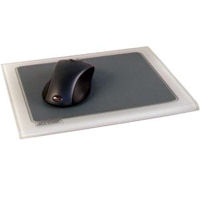 The Mouse Pad XL from Allsop is an extra large mousing pad, giving you the extra space you need. Made of woven fabric, the Mouse Pad XL has a Techgrip base preventing it from sliding on the your desk. Measures 15.5" x 13.0". The Wrist Assist from Allsop is designed to work along with your mouse to provide additional wrist support. With no edge to slide off and easily positioned anywhere along your arm, it allows for smoother mousing movements. Note: Due to the nature of this product we cannot offer our 30 day customer satisfaction guarantee on this product. The Comfortbead Wrist Rest for Keyboard from Allsop helps prevent wrist stress while typing. Soft plastic beads in the cotton cover gently cushion your palms and wrist, whatever the shape of your keyboard. Note: We are unable to offer our 30 Day Customer Satisfaction Guarantee on this product. The Comfortbead Wrist Rest for Mouse from Alsop helps prevent wrist stress while mousing. Soft plastic beads in the cotton cover gently cushion your palms and wrist, whatever range of motion you need to move your mouse.